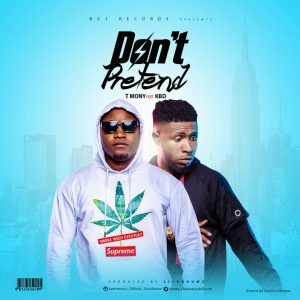 The BGI records front liner, songwriter and Nigerian RnB singer “Tmony” is here again with this trending love song “visual” titled “Don’t Pretend” this time he teams up with Enugu fast rising rapper and producer KBD aka Sickdrumz. Baltimore Chizoba Ugwu aka “Tmony” is a citizen of Ugwuaji Awk Enugu south LGA Enugu state Nigeria. He has showed how versatile and gifted he is on this Jam and he’s ready to take the industry by Storm with this latest release “Don’t Pretend” and more. They both leveraged their distinct vocals to deliver an uncommon blend on this record. The artistic video is quiet entertaining watch and Enjoy the visual below.